Kollur Mookambika Temple is 40km from Kundapur Town, about 140 km away from Mangalore City in Karnataka state in Southern part of India. 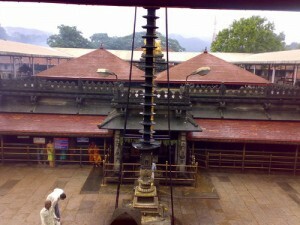 Kollur village lies at the foot of the Western Ghats, and is famous for the Mookambika temple, a Hindu pilgrim center. Kollur is an important seat of Shakti worship. Legend goes that a Maharishi (monk) Kolan was enchanted with nature’s beauty and decided to perform a penance on a rock near the Agnitheertham. Lord Shiva, delighted with Kolan, appeared before him and blessed him. The Maharishi wished for the welfare of mankind and nothing else. The Lord, happy with Kolan, granted him his wish. He assured that a swayambu (autogenetic) Lingam (Shiiva Stone) would appear for his daily worship. However, Kolan wanted to worship Devi also. So, a Swarna Rekha (gold line) appeared on the Lingam, signifying Shakti. Thus, Shiva and Shakti are worshipped together in the Lingam. It is believed that Adi Shankaracharya had a vision of Sri Mookambika Devi and installed the deity here. The legend goes, that Adi Shankara mediated at Kudachadri (Kotachdri) hills and Devi incarnated before him asking for his wish. He revealed his wish to incorporate Devi to a place in Kerala to worship where he wanted.Devi agreed and put forward a challenge that she will follow Shankara and he should not look back until he reaches his destination. But to test Shankara Devi deliberately stopped the voice of her anklets when they reached Kollur, and Shankara turned and looked back because of doubt. Devi then asked Shankara to install her vigraha as he sees her. Devotees from all over South India visit this temple. Kollur is believed to be one of the seven pilgrim centers created by Parashurama, a Hindu mythological figure. The temple is devoted to the Hindu goddess Parvathi, wife of Shiva. While the other pilgrimages created by Parashurama are devoted to Lord Shiva, Lord Subramanya and Lord Ganesha, this is the only one devoted to goddess Parvathi. is world Wildlife Fund Aided. This sanctuary is home for endangered species animal called Lion tailed monkey. 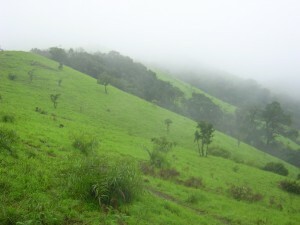 Spread along the Kundapur-Kollur- Shimoga road, this sanctuary is generally off the tourist map. Kollur is around 36 km from Kundapur, the taluk head quarters. From Kundapur, one can take three different routes to reach Kollur. * One route is via Tallur-Hattiangadi-Karkunje-Vandse. * Second route via Hemmadi-Vandse and third one is via Byndoor. * However, the shortest route is through Hemmady. 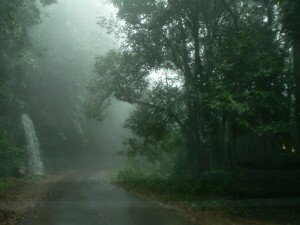 On the National Highway 17, after around 7 km from Kundapur, at Hemmady one has to take right deviation to reach Kollur. * The nearest railway station is Kundapura (40 km) where a few long-distance trains halt. You can get taxis from the station. The station has a waiting room for the passengers. Railway Station Phone no: +91-8254-237365. Byndoor (28 km)is another station where a few long-distance trains halt. 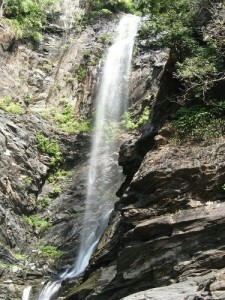 It is situated between Kundapura and Bhatkal stations. Buses are available every 30 minutes from 6:00 in the morning to 8:30 in the night. Bus stand is 3 km from the railway station. * Kollur is a 2 hour drive from Udupi (Famous Krishna teample), so a visit to Udupi can include Kollur. The drive is very scenic one. This entry was posted in Holidays, Karnataka, Temples and tagged ''kerala, Arisihna Gundi, Bajpe, Bhatkal, Byndoor, drive kollur, Hattiangadi, Hemmadi, Karnataka state, Kodachadri, Kodachadri Mountain, kola, kollur, kolluru, Krishna teample, Kudachadri, Kundapur, Lingam, Lord Ganesha, Lord Shiva, Lord Subramanya, Mangalore, mookambika, Mookambika Devi, mookambika temple, Parashurama, reach Kollur, Shakti worship, Shankaracharya, Shimoga road, train kollur, udupi, Vandse, Water falls, Western Ghats, Wildlife Sanctuary. Bookmark the permalink.